M33. My first British bike after all these years. Well everyone ‘tis my first post. After riding for something like 45 years I’ve finally bought my first British bike. When I started riding, Japanese 2-strokes were all the rage and since the late ‘70s I’ve ridden Moto Guzzis almost exclusively. 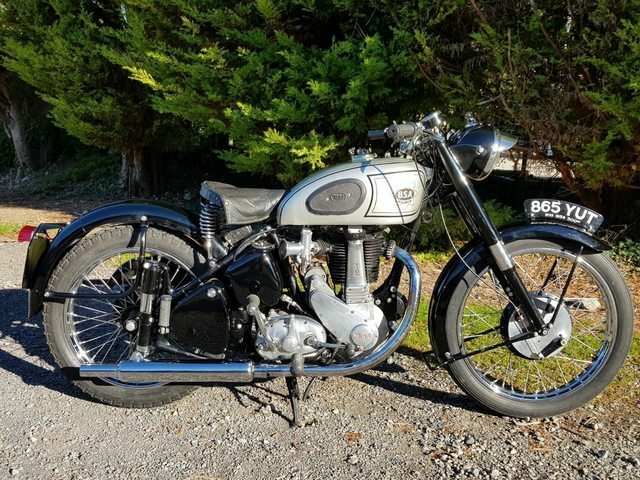 I decided that, if I was to try the Brit bike experience I’d better get on with it ended up buying a 1954 plunger-framed M33. In the few weeks since it took up residence in my garage with my two ‘70s Guzzis, I've been able to get the starting technique right but only managed one short ride out due to the weather and salt. It wasn’t totally frightening and I was actually impressed with how nippy it was up to the 55mph mark. The brakes are also plenty good enough. From a riding point of view the worst thing was the lack of a mirror to see what is bearing down on me but that can easily be sorted. The bike isn’t original. A previous owner has written B33 on the number plates but it's definitely an M33. I think the fuel tank is from a different BSA but all the mounting bolts line up. For some reason it’s been fitted with a 21 inch front rim. It can’t be described as oil-tight but I’ve seen worse. There are a few things that I’ll have to do fairly quickly besides fitting a mirror. I’ll fit a side stand and will need a luggage carrier (behind its single saddle) and I need to get the horn working. Here comes the question and it’s the dreaded engine oil one. I intend to use a 20W50 but should it be low-detergent type like I use in the Guzzis, which have wet sump engines with only a gauze strainer and no proper oil filter, or should it be something else? Does it even matter? Re: M33. My first British bike after all these years. Thanks for the links Glenn. It seems that it doesn't really matter which 20W50 I use. As the bike won't do a great mileage and the oil will get changed often that's probably enough. You can spend too much time worrying about these things and there is the best part of a 20 litre drum of my usual stuff just stood there. A friend said it might be a military fuel tank but I think he was going by the filler cap with the twist lever on the top to lock it, same as on the oil tank. Someone else said it might be an A10 tank. It does seem to have two fuel tap fittings with a blanking plug screwed in one. One thing it isn't is a silver star. I definitely think the tank is early war WM20 or KM20 (up to end of 1941 or so) the tank fitted the same as the mounting ponts never changed. Actually, one other things about the early tanks for the side valve M20/M21 is that the underside was cut away, much the same as you would require for the OHV head found on the M33. This could be a reason why this was fitted. I'm not actually sure if all other M series tanks had the same cut outs.